Oshun is the orisha of sweetness, love and everything that makes life worth living. This is Oshún is Ibú Asedán – a road of Oshun that loves to hunt. Oshun (also spelled Ochún, Oṣun or Oxum) is the youngest of the orishas and probably the most popular in Santeria. She was the last orisha born in the world out of Olodumare’s love for creation. She is the orisha of love, beauty, femininity and sensuality which leads many people to compare her to Venus or Aphrodite. Such a comparison is short-sighted, however, for Oshun is vast and powerful; she is actually the full breadth of womanhood. From the young, enthusiastic coquette that flirts with boys to the old matriarch that sits in a rocking chair, hard-of-hearing, reminiscing of her youth, Oshun contains every woman’s story within her patakis. She makes her residence in the rivers of the world. Hers is the power of sweetness in life, and all of the things that make life worth living. Oshun represents all of the phases of a woman’s life and her worship was popular in Africa. Because of this she has many roads or “caminos”, each encapsulating a different aspect of her persona. She is often depicted as a beautiful mixed-race woman with long hair carrying a fan and a mirror (reflecting her connections with beauty and femininity). She is a savvy diviner, schooled in the 16 major odus of the diloggun, and the wife of Orunmila (as the road Oshún Ibú Ololodí). She is a powerful sorceress, weaving spells to intoxicate her lovers (as the road Oshún Ibú Ikolé). She has a special relationship with the sacred Añá drums and dances to forget her sorrows (as the road Oshún Ibú Añá). She is very giving and protective of those who love and respect her, but she is also quick to turn sour against humanity when she is offended. It is not likely Oshun will forgive those who have offended her. It is said when Oshun possesses her olorishas, if she arrives crying it is a good sign, for they are tears of joy. If possesses her olorishas and arrives laughing it is a bad sign for it is maniacal laughter that demonstrates her anger. She loves honey as her favorite offering, but it is important to taste it first to show her that it is a worthy offering, and not a trick. Oshun is the mother of the Ibeji “divine twins” (fathered by Changó) however she kicked them out of her house when she was accused for being a witch (as she was the first woman to give birth to twins). Oyá took the Ibeji in and raised them (some say Yemaya took them in and raised them). Later, she lost everything and found herself destitute. She mothered Ideú, a son born after the Ibeji, given to her by Olofi to restore Oshun’s lost blessings. Oshun is one of the “four pillars” of Santeria, along with Obatala, Yemaya and Chango. As such, every olorisha that is initiated in Santeria will receive her shrine in their initiation whether they are her child or not. Oshún is probably the most popular orisha in Santeria because of her willingness to help those seeking love, children or money in life. Oshun is very generous to those who love and respect her. 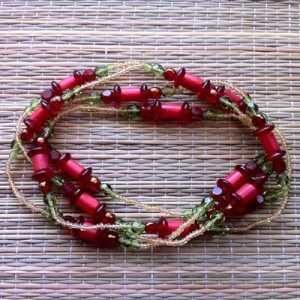 Most Oshun elekes are made with honey colored beads and/or yellow beads. 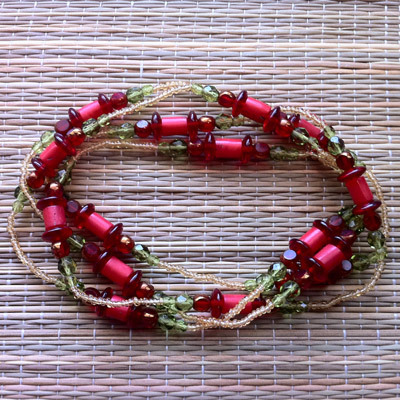 This eleke for Ibú Asedán contains lots of coral as well as red and green beads. Oshún has many caminos (roads) or avatars. Each road has a slightly different temperament and particularities. All roads of Oshun are called “Ibu” meaning “pool of water” or “spring. Here is but a sampling of her caminos. Oshun’s has a taste for sweet things, and she prefers refined treats like honey, pastries or cakes. Some followers of Santeria offer her champagne or sparkling wine. Oshun eats castrated goat, hens, pigeons and guinea hen. On rare occasion she enjoys eating pheasants. 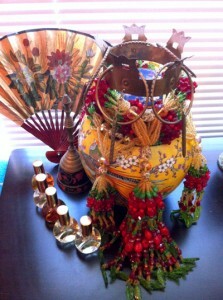 All offerings for Oshun should be marked through diloggun divination for best results. Here’s another delicious treat you can offer Oshún. You’ll need 2 yams, 1 orange, 1/2 of brown sugar, 1/2 cup of honey, 1 teaspoon of cinnamon and 1/2 a stick of butter. Pre-heat the oven to 350°F. Take 2 large yams (the orange ones), peel them and cut them into 1″ cubes. Place these in a pyrex or other oven-safe dish. Drizzle the honey over the yams, and sprinkle the brown sugar over the yams. Squeeze the juice of the orange over the yams. Soften the butter and daub pieces of it all over the top of the yams, then finish by dusting the yams with the cinnamon. Bake these in the oven at 350°F until the yams are soft when poked with a fork about half an hour or so. When done, remove the dish from the oven and serve a small bit of it to Eleggua on a plate, then serve a healthy portion of it in a ceramic bowl to Oshún. Leave the addimú there for the number of days marked by diloggun divination then dispose of them in the places in nature as dictated through divination.